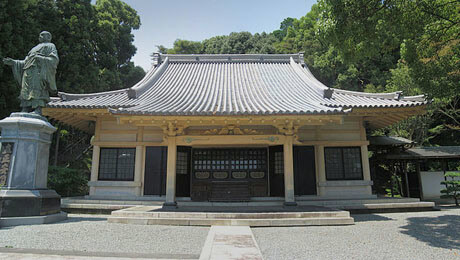 Nichiren Shonin contemplated societal issues leading to his creation of the “Rissho Ankoku Ron” and studied all the scriptures of Buddhism in order to pursue the real teaching in the library of Buddhist scriptures (Kyozo) at Jissoji. This temple is located in a serene environment where one can see Mount Fuji, and it seems natural that Nichiren Shonin would chose this place to ponder such matters. During the initial period of his propagation (around 1257-1260), great disasters, such as earthquakes, floods, famines and epidemic diseases, and many wars ravaged Japan. These concerned Nichiren Shonin gravely and made him enter Jissoji to figure out the reasons behind such disasters and their solutions. Jissoji then maintained one out of two sets of Issai-kyo (a complete collection Buddhist scriptures of that time) brought by Enchin from Tang Dynasty China, sponsored by the Japanese Emperor. Nichiren Shonin spent full two years to study, contemplate and write “Rissho Ankoku Ron.” He submitted it to the country’s ruler, Hojo Tokiyori, in July of 1260. 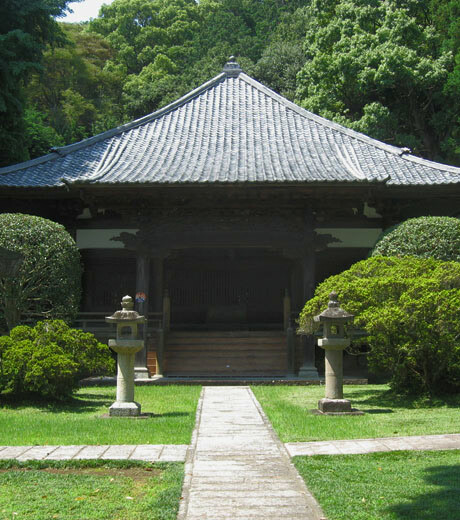 Jissoji was erected in 1145 as a Tendai Shu temple by Toba Hohoh (retired emperor). The Issai-kyo brought by Enchin was securely retained. Jissoji once comprised 49 temples and was a center of Buddhist scholarship. In 1568, Jissoji was burned down by Takeda Shingen, however the scriptures survived unscathed. The temple was re-established by the ninth priest, Nichiko, during the Keicho era (1596-1615.) Since that time, Jissoji has been damaged by natural disasters such as typhoons, but it has always been repaired with the support of many noble families throughout history. The Issai-kyo-do (Hall of Buddhist Scriptures) is located above the Soshi-do (Hall of the Founder). The statue of Nichiren Shonin holding the first draft of “Rissho Ankoku Ron” is enshrined inside of Soshi-do. In addition to these buildings, Jissoji consists of a Hondo (Hall of Shakyamuni Buddha), Shichimen-do (Hall of Shichimen), Sanmon (Temple Gate), Shoro-do (bell), Kuri (living quarters) and other buildings.